The rate at which electronic care records systems are being put in place across the NHS under the National Programme for IT is falling far below expectations and the core aim that every patient should have an electronic care record under the Programme will not now be achieved. "The original vision for the National Programme for IT in the NHS will not be realised. The NHS is now getting far fewer systems than planned despite the Department paying contractors almost the same amount of money. This is yet another example of a department fundamentally underestimating the scale and complexity of a major IT-enabled change programme. "The Department of Health needs to admit that it is now in damage-limitation mode. I hope that my report today, together with the forthcoming review by the Cabinet Office and Treasury, announced by the Prime Minister, will help to prevent further loss of public value from future expenditure on the Programme." The rate at which electronic care records systems are being put in place across the NHS under the National Programme for IT is falling far below expectations and the core aim that every patient should have an electronic care record under the Programme will not now be achieved. Even where systems have been delivered, they are not yet able to do everything that the Department intended, especially in acute trusts. Moreover, the number of systems to be delivered through the Programme has been significantly reduced, without a commensurate reduction in the cost. Today’s NAO report concludes that the £2.7 billion spent so far on care records systems does not represent value for money. And, based on performance so far, the NAO has no grounds for confidence that the remaining planned spending of £4.3 billion on care records systems will be any different. 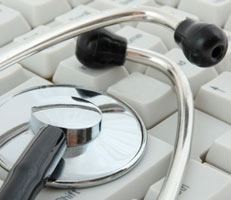 The original aim of the Programme was for every patient to have an electronic care record by 2010. The systems the Department contracted its suppliers, BT and CSC, to deliver are now not all expected to be in place until 2015-16. Even so, based on performance so far, it is unlikely that the remaining work in the North, Midlands and East, where just four of 97 systems have been delivered to acute hospital trusts in seven years, can be completed by 2016 when the contract with CSC expires. Indeed, in order to meet the revised deadline, over two systems a month would need to be delivered in this Programme area over the next five years. Progress in delivering care records systems varies dramatically between regions. There has been more progress in London in some health settings, although no GP practices are now receiving a system through the Programme and the number of systems in acute hospital settings has halved. Where care records systems are in place, they are not yet delivering what the Department had expected. In acute trusts, the systems are mainly providing administrative benefits, rather than the expected clinical ones, such as prescribing and administering drugs in hospitals. The Department has now changed its approach and moved away from its intention to replace systems wholesale, instead, building on and using trusts’ existing systems. To do this the Department estimates it will cost at least £220 million to get the systems to work together.